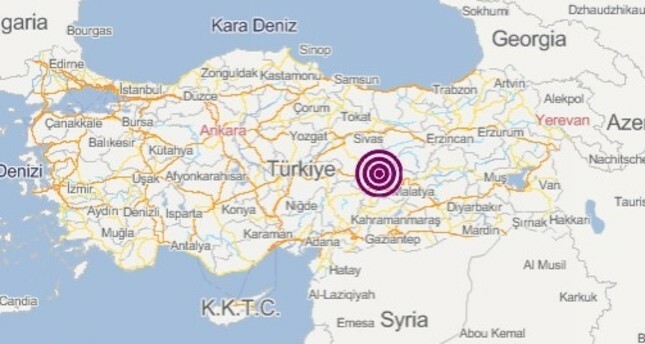 A 4.5 magnitude earthquake struck Turkey's eastern Malatya province on Monday. The quake shook the Arguvan district at a depth of 7 kilometers (4.3 miles), according to Turkey's Disaster and Emergency Management Authority (AFAD). Arguvan District Gov. Abdullah Şahin said no injuries or damage had been observed in the district, after emergency reponse teams surveyed villages in the region. "Our district does not have any issues or destroyed or damaged buildings," he said. Şahin, who said the earthquake hit right at the border of the district, added that the situation in the bordering Hekimhan district had not been determined.